Join us in asking our legislative leaders to move forward quickly with Senate Bill 22 and House Bill 722. 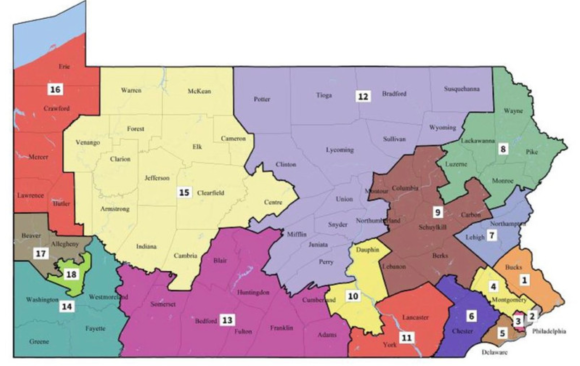 Today the Pennsylvania Supreme Court released a new congressional district map with just thirteen split counties, compared to the 28 splits in the current map, and with several genuinely competitive districts. We believe both the PA Supreme Court opinion (available here) and the map itself are significant wins for the people of Pennsylvania and for citizens in other states with similar constitutional provisions for free and equal elections. But the ultimate win would be a transparent process that invites citizen input and ends the conflict of interest that allows party leaders to ensure their own repeated re-election. In the days between submission of maps and release of this final map, analysts and citizens offered comment and critique, discussing on social media the benefits of some maps, the failures of others and possible priorities for evaluating maps. Should a map ensure that NO voting precincts be split? Should county seats be kept with the majority of their counties? Is it better to split our major cities, opening the door to more competition even there, or to keep the cores of cities intact? We believe the public would be well served by conversations of that kind in every redistricting process, not just for congressional maps, but also for house and senate district maps. And we believe the process should be overseen by citizens, like Jon Kimmel, whose eighth grade math class drew their own set of district maps, or Amanda Holt, piano teacher turned Lehigh County commissioner, who analyzed every map submitted then drew one of her own. The fight to reclaim our democracy is far from over. In recent days, Senate President Pro Tempore Joe Scarnati, Majority Leader Senator Jake Corman and Senate State Government Committee Chair Mike Folmer have stated that they would have moved forward with redistricting reform if redistricting lawsuits had not interrupted them. In reality, they have had multiple opportunities, over multiple legislative sessions, to enact reforms supported by the League of Women Voters of Pennsylvania, Common Cause PA and some of the same primary sponsors supporting SB 22 and HB 722. And as many lawyers and judges have assured us, there was never any legitimate legal reason to delay discussion of those bills, despite ongoing lawsuits. At present 18 of their colleagues have co-sponsored Senate Bill 22, recognizing the harm done to voters and to our legislature itself when gerrymandering undermines our electoral integrity. In the House, House Bill 722 now has 108 cosponsors, an ample majority and the most of any bill introduced in this session. Yet Speaker Mike Turzai and Majority Leader Dave Reed have ignored requests for meetings with constituents and Fair Districts PA representatives, while House State Government Chair Daryl Metcalfe belligerently insists House Bill 722 will NEVER be given a hearing, despite multiple requests for meetings and hearings from many of his colleagues and constituents. Please join us in asking our legislative leaders to move forward quickly with Senate Bill 22 and House Bill 722.